Office Product Key Finder is offline product key finder software and allows to recover and find microsoft office 25 character product key for Microsoft Office 2013, Microsoft Office 2010, Microsoft Office 2007 and Microsoft Office 2003 installed on your PC or on network computers. 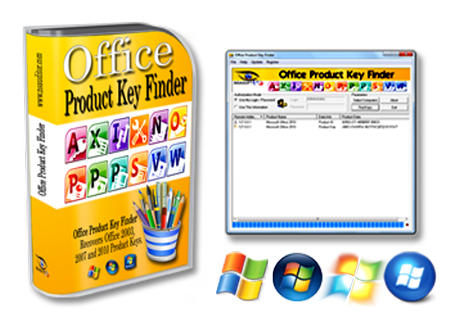 - Office Product Key Finder is offline product key finder software and allows to recover and find microsoft office 25 character product key for Microsoft Office 2013, Microsoft Office 2010, Microsoft Office 2007 and Microsoft Office 2003 installed on your PC or on network computers. - In order to install or reinstall Microsoft Office you must have access to Microsoft Office product key ( serial number, CD Key). - With Office Product Key Finder software you will be able to track the number of Microsoft Office product keys installed in your business, find and recover a lost or forgotten MS Office product keys. - You can backup located Microsoft Office product keys to Registry File (.reg), save as Tab Delimited Txt File (.txt), CSV Comma Delimited (.csv), Excel Workbook (.xls), Access Database (.mdb), Web Page (.html), SQLLite3 Database or XML Data (.xml) file, print key list or copy all to clipboard. This utility can be useful if you lost the product key and you want to reinstall it.